It is rare to find a hotel with so much charm and character. Built in the local style, it climbs up the hillside with secret courtyards, spectacular views and everywhere you turn local arts and crafts including samples of traditional costumes. The décor of all the rooms makes great use of local designs and textiles, while offering a high standard of comfort and modern conveniences. Most rooms have views of the forest-clad mountains while the remaining look out over the lush gardens. The restaurant is renowned, attracting gastronomes from all over the island and even the mainland. The focus is on traditional Sardinian specialities including ‘porchettu’, pork roasted on juniper wood spits. Also on offer are a variety of home-made pastas, breads and pastries and a wide choice of wines, including the very good local Oliena wine. An excellent breakfast is served on a large terrace, with country-style furnishings and lovely views overlooking the swimming pool which is filled with water from the Su Gologone spring. 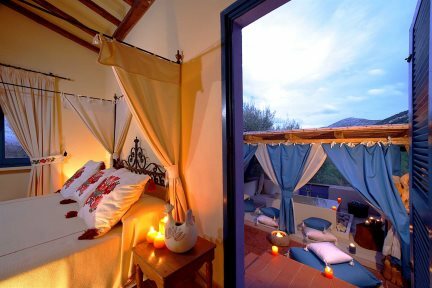 The ideal base for walking in the wild Sardinian countryside and hiking up the mountains, you’ll also find fascinating craft workshops on offer, star-gazing evenings observing a night sky unaffected by light pollution, as well as wine and grappa tasting in the hotel’s cellars. Swimming pool, outdoor Jacuzzi, 3 restaurants, 3 bars: Bar Ciusa, Bar Gazebo, Bar Tablao, wine cellar, tennis courts, mini golf, children’s play area, gym, Wi-Fi. Payable locally: wellness centre, horse riding, wine and oil tasting, excursions, mountain bikes. En-suite facilities, television, telephone, mini-bar, air-conditioning, Wi-Fi, safe, kettle, coffee machine. All rooms are elegantly presented with antique furniture, traditional Sardinian fabrics and remarkable artefacts - all this enhanced by whitewashed walls and wooden beams. 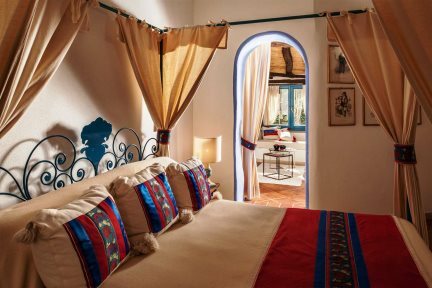 These larger rooms are elegantly presented with antique furniture, traditional Sardinian fabrics and remarkable artefacts - all this enhanced by whitewashed walls and wooden beams. All rooms are elegantly presented with antique furniture, traditional Sardinian fabrics and remarkable artefacts - all this enhanced by whitewashed walls and wooden beams. Junior suites are larger than the Deluxe and Classic rooms. All rooms are elegantly presented with antique furniture, traditional Sardinian fabrics and remarkable artefacts - all this enhanced by whitewashed walls and wooden beams. Suites are the largest rooms in the hotel with the added benefit of a lounge area and hydromassage bath. Surrounded by vineyards, olive groves and almond orchards, Oliena is a picturesque town with quaint streets and a 15th century church. The town itself has a reputation for producing one of the island’s finest wines. From here, you can get guided tours to the archaeological site of Tiscali, a Nuraghic village deep in the mountains.